In Morocco, these are called baghrir. Combine all the ingredients in a blender and blend until smooth. Allow the batter to rest 30 to 60 minutes. Heat a medium skillet over medium heat. Pour about ¼ cup of the batter into the pan and cook the pancake for one to two minutes until the surface of the pancake is dry and porous throughout. There is no need to turn the pancake over as it only cooks on one side. 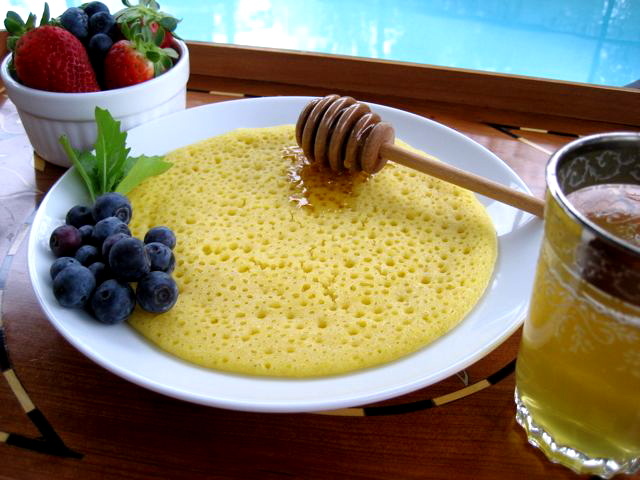 Serve the pancakes slightly warm with honey or maple syrup and fresh fruit.